Karl Schroeder. Lockstep Conclusion (Part IV of IV). Jordan Jeffers. A Fierce, Calming Presence. Eric Baylis. The Oracle of Boca Raton. 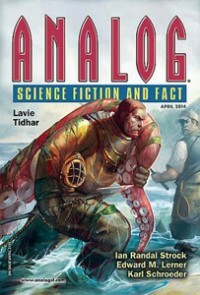 Lavie Tidhar. Whaliens. An excellent story which I’ve reviewed here. And by my reckoning that’s the first issue of Analog I’ve noted that doesn’t have an author with a middle initial in his (for Analog authors are mostly male) name, or, more seriously, the first issue without one (or more!) of Analog stalwarts. Is editor Quarchri wielding a new broom?? Content listings and reviews of previous issues (10 years worth!) of Analog here.